Two of the most exciting fighters, Lucas Matthysse and Jorge Linares, will compete in separate world championship bouts on Jan. 27, 2018 at the “Fabulous” Forum in Inglewood, California. 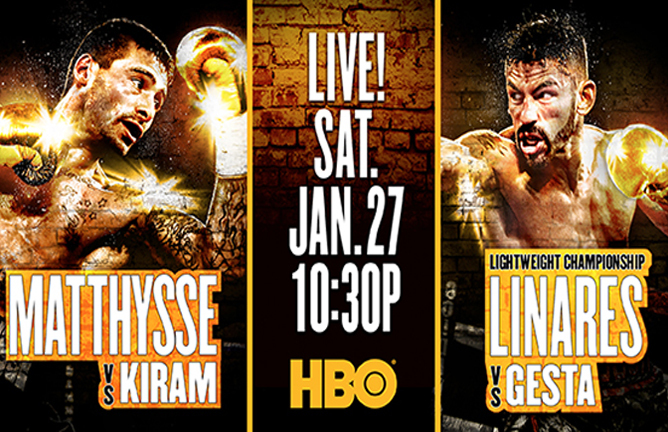 HBO Boxing After Dark host the double main event live, beginning at 10:20 p.m. ET/PT. The first co-main event will see the 35-year-old Matthysse, facing undefeated Thai superstar Tewa Kiram in a battle for the WBA Welterweight World Championship. In the second co-main event, Jorge Linares will make his second trip to the Forum in a row to defend his lightweight world championships against Mercito Gesta. Gesta, a 30-year-old from the Philippines, has not lost in six fights, beating opponents including Gilberto Gonzalez and Martin Honorio. Gesta is getting his second shot at a world championship after dropping a unanimous decision to Miguel Vazquez for the IBF World Lightweight Championship.